Some examples: we hear what it is like to explain what has happened to a woman patient in whom one of the mishaps which is always a risk in brain surgery has left her paralysed down one side. He tells her he knows from experience that there is a good chance it will improve. I had no immediate reply to this and stared uncomfortably at my feet. He describes visiting a Catholic nursing home which cares for patients with serious brain damage. He recognises some of the names on the doors, and realises them to be former patients of his own for whom things didn’t go as well as he would have hoped. I have often imagine what it must be like to be wielding a scalpel, poised over a patient’s skin, and then to be cutting into a stomach or a leg – never mind a brain. Of course a long training, learning from the experts and eventually taking your own first steps would give you the confidence to be able to cope with this; but it’s to Marsh’s credit that he has retained such a degree of self-doubt. Indeed, he speculates on the personalities of some of the great neurosurgeons of the past, who didn’t have the technical facilities of today. Advances could often only be made by taking enormous risks, and Marsh imagines that it would sometimes have been necessary for them to insulate themselves against concern for the patient to a point that marks them as having not just overweening self-confidence, but poitively psychopathic personalities. I’m lucky not to have been under the knife myself very often, and never, thankfully, for the brain. But what I have experienced of the medicine has shown me that personalities which, with their unusual degree of arrogance, verge on the psychopathic, are all too common in the higher reaches of the profession. One who sticks in my memory wasn’t actually treating me: he had been commissioned to supply case histories for a medical computer program that I was involved in producing. This was not neurosurgery, but another area of medicine, in which I was aware that he was pre-eminent. We went through these case histories, some of them very complex, which he explained. “I diagnosed that,” he would say, visibly preening himself. On the whole he was perfectly good to work with, provided you showed a decent amount of deference. But at one point he moved beyond the subject matter, to lay down how he thought the program should work. This was my area, and I could see some problems with what he was saying, and explained politely. There was an icy pause. Although never less than polite, he proceeded to make it clear that nobody, least of all a cypher like me, was authorised to challenge an opinion of his, on anything. (Later I went ahead and did it my way in any case.) This was back in the eighties, nearly 30 years ago. Thinking about him before writing this, I googled him, and sure enough, he’s still out there, working at a major hospital and with a Harley Street practice. He must indeed have had enormous ability to have been at the top of his area for so long; but as a practitioner of the healing art he was, like, I suspect, many others, definitely not cuddly. 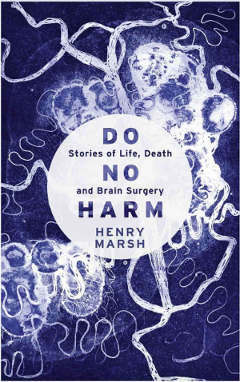 On the radio programme I heard, Henry Marsh remarked that, if you accept praise for your successes, you must accept blame for the failures, and that there are the medical practitioners who don’t follow that precept. I suspect that my friend described above would have been one of them; I have never encountered a level of self-regard that was so tangibly enormous. Perhaps we should be thankful that there are those who harness supreme technical skill to such overweening confidence – but you shudder a little at the thought of their scalpel in your brain. If this was to befall me, I’d much rather the knife was wielded by someone of Marsh’s cast of mind, rather than an equally skilful surgeon with all the humility of a bulldozer. This entry was posted in Books - Non-fiction, Commuting & life in general and tagged brain, medicine, Reading, surgery. Bookmark the permalink.